Detailed instructions are given on how to grow a magnolia tree from cutting by propagating in easy to follow steps. Magnolia tree is one of the most attractive trees one can have at home. The magnolia trees are attractive due to their large glossy dark green leaves and fragrant blossoms. These attractive trees find an important place in any landscape. These trees are quite costly, $100 for a small tree. So, it is quite interesting to propagate magnolia tree at home. 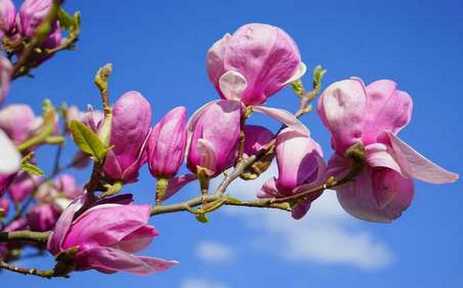 Continue reading below to learn how to grow a magnolia tree from cuttings at home successfully. The procedure is the same for propagating different types of magnolia cuttings including magnolia Grandiflora, Japanese, Southern magnolia, Little gem, etc. You can propagate magnolia trees from cuttings, seeds (seed pods) and air layering methods The magnolia tree grown from seed will be very slow to grow and only bloom after 8-10 years. The magnolia cuttings are difficult to root, but the tree will be faster to grow and will flower in about 2-3 years time. Propagating magnolia trees from cuttings is simple but the success rate is quite low. I tried 4-5 times to start a magnolia tree from cuttings, but each time I they did not strike and failed. I have now somewhat mastered the technique of starting the magnolia tree from cuttings. But still, the success rate may be 50 percent. You can try the following method to root the magnolia cuttings quickly. If you want to grow magnolia from seeds, autumn is the best time for sowing seeds. The propagation of magnolia from cuttings is done when the temperature is more than 21 C (summer), i.e. from December to Februrary in Australia and by grafting in autumn. Start propagation in the morning or evening. One of the important thing for the success in rooting a magnolia tree is the cleanliness. Wash the pruning shears/knife and rooting pot with dilute bleach solution or denatured alcohol. Taking cuttings correctly is the most important step for getting success in propagating magnolia trees. What type of magnolia cuttings are suitable for rooting, hardwood or softwood for propagation. Select the newly growing tips of branches (softwood magnolia cuttings), about 6-7 inch long and 3-5 mm in diameter. Preferably take stem cuttings from the point where the new growth has emerged from old wood. Place the cuttings in clean water as you prepare for other things. Free draining propagating soil is needed. I mix 1 part potting mix with 3 parts washed river sand or perlite. You could take coarse river sand without mixing anything to it. Take a small pot (3-4 inch diameter) with several holes at the bottom. The small pot is suitable for propagating one cutting. I take 10 inch pot and try to root 4-5 magnolia cuttings together. Fill the pot with the propagating medium and water thoroughly. Water again and turn the soil to ensure that the soil is wet at all places. Keep the pot aside for half an hour. In the meantime, you prepare the cuttings. Take one cutting and remove all of its leaves except the top 2-3 leaves which you cut into half. Scrap lightly the lower 1 inch of the cutting with the knife and make a 1 inch vertical cut (from bottom of the cutting to 1 inch up) at the center. Apply rooting hormone at the lower end, scrap portion and in the slit of the cutting. Insert a stick in the soil down to a depth 1 inch above the bottom. Insert the prepared cutting in the hole (do not push) and secure it by pressing the soil around it. Similarly plant all the cuttings. Enclose the pot in a ziploc bag to keep in humidity. I enclose it in a clear plastic bag and tie it at the top. Place the pot in a bright place but away from direct sun. Every week, open the bag and mist the cuttings. Close the bag again. Remove any fallen leaves. After about 4-6 weeks, new growth will emerge. This is the time when the roots are starting to begin. Keep the pot enclosed for another 2-3 weeks. After that, open the bag and see if there are roots emerging from the bottom holes of the pot or just tuck the cutting, if it is resistive, that means that the roots are there. Warning: Do not pull out the cutting to see if it has rooted. Open the bag for half day only for next 3-4 days. Remove the bag and place the pot in shade for 1 week. Allow the morning sun for 1 week. The next step is to transplant the rooted magnolia cuttings in pots filled with highly nutrient soil.